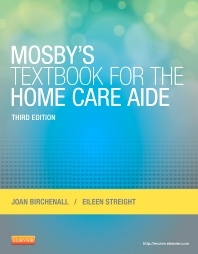 Covering the essential content and procedures a home care aide needs to know, Mosby’s Textbook for the Home Care Aide, 3rd Edition prepares you for success in this rapidly growing field. A clear approach makes the book easy to use and understand, featuring hundreds of full-color photographs and drawings along with step-by-step procedures for skills performed by home care aides. Updated and expanded in this edition are chapters on meeting the client’s nutritional needs and on getting and keeping a job. Written by home care experts Joan Birchenall and Eileen Streight, this textbook prepares you for the many types of situations you may encounter as a home care aide. Hundreds of full-color photos and drawings depict key ideas and clearly demonstrate procedure steps. Procedures provide step-by-step, easy-to-understand instructions on performing important skills and tasks. UNIQUE! A cast of caregivers, including a supervisor and four home care aides, are highlighted in scenarios that provide realistic examples of the types of situations you are likely to encounter in the home care environment. Guidelines for Observing, Recording, and Reporting (ORR) are highlighted throughout the text, emphasizing the home care aide’s responsibilities for observing and documenting the client’s condition and care. Key considerations and reminders are presented in color font to emphasize the importance of performing these actions. Objectives and Key Terms in each chapter focus your attention on essential information. Chapter summaries and study questions review the key points in each chapter.